Rings - loops of atoms - are of fundamental importance to organic chemists. They make molecules more rigid, more predictable, and sometimes easier to make. The smallest rings consisting of three atoms are hard to make because the 60-degree angle of an equilateral triangle is far smaller than the 'perfect' 109-degree bond angle of a typical carbon atom (so-called ring strain); while large rings are hard to make because it is difficult to bring the ends together. Five- and six-membered rings are optimal because ring-strain is minimised and the ends are not too far apart. So it is no surprise that five-and six-membered rings are often found as the constituent parts of drugs and biologically active molecules from nature. We were interested in the fungal metabolite xenovulene A which contains four rings fused together. Xenovulene A is an unusual compound with potential use as an antidepressant drug. We already knew from the results of previous workers that the 11-membered ring comes from a molecule known as humulene, but the source of the others was mysterious. We investigated the construction of xenovulene A by finding genes involved in its biosynthesis, and then transferring them, one by one, to a new host fungus. Since each gene encodes one protein, which performs one of the chemical steps, we were able to observe the individual steps of the biosynthesis. The pathway starts with the formation of a six membered ring, which is expected. But then Nature surprised us: the six-membered ring is first expanded to a seven-membered ring known as a tropolone, before reacting with humulene. The seven-ring is then contracted, first to a six- and then to a five-membered ring. There were more surprises too: humulene itself is made by a cyclase enzyme, but this enzyme appears to be unrelated to any known cyclase; and the connection of humulene to the tropolone is the first observed example of a bimolecular hetero-Diels Alder reaction in a biological setting. So why does Nature seem to make xenovulene A the hard way? Evolution must contribute a large part of the answer. The ring expanding enzymes are already known in fungi and provide an efficient way to make unusual 7-membered rings known as tropolones, many of which are biologically active; and other fungi have already solved the problem of linking tropolones to humulene to form 7-6-11 ring systems. 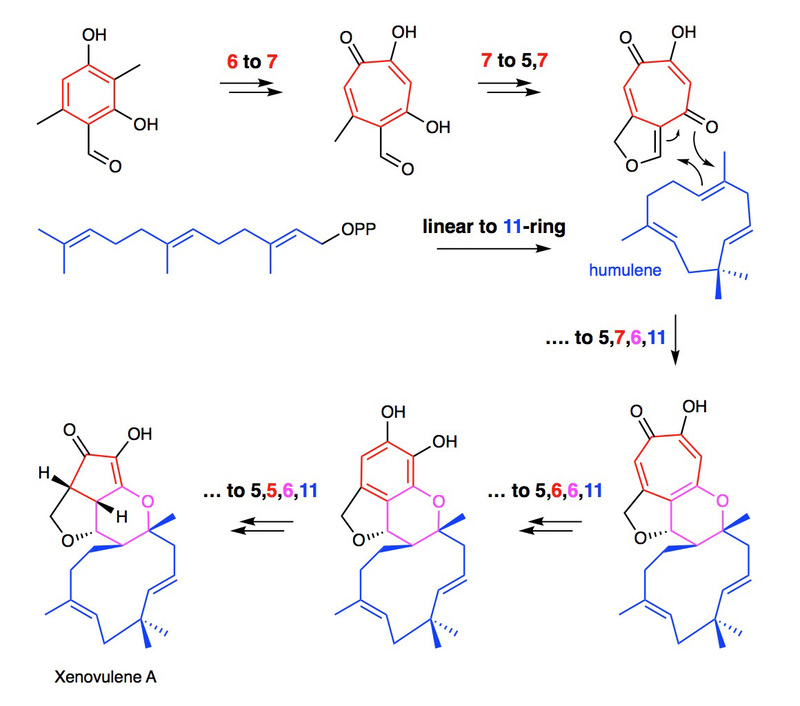 So the formation of xenovulene only required one new type of reaction to shrink the tropolone to a 5-ring in two steps. From an evolutionary perspective it is simpler (and quicker!) just to add more chemical steps rather than to reinvent an entire pathway. Because the products and intermediates are biologically active this gives the producing organism a competitive advantage. The evolutionary relationships between the enzymes involved in these complex pathways help us too: the links we have discovered here will help us find new biosynthetic pathways to new compounds in new fungi. And because the pathways have evolved to produce compounds which are biologically active, this should be a good way to find new drugs.